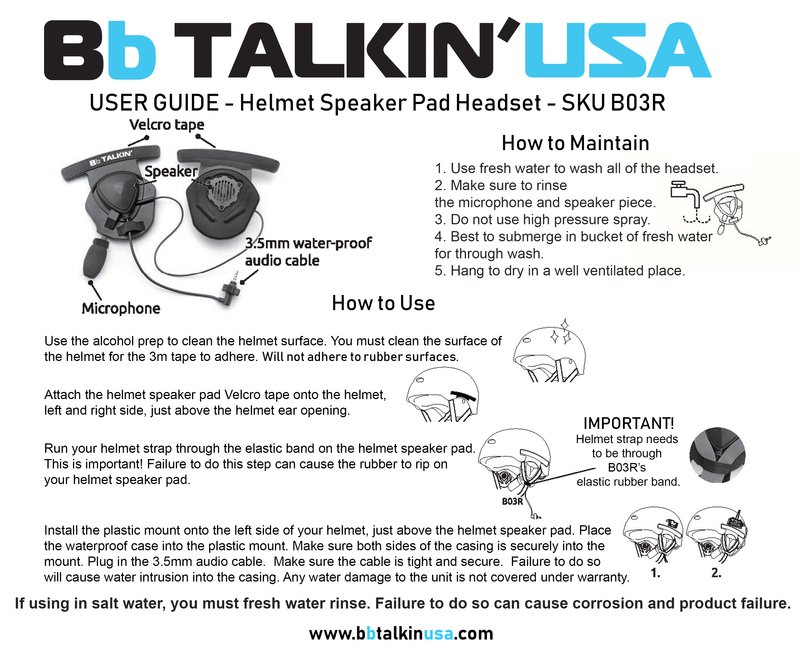 Double sided helmet speaker pad with microphone by BbTALKIN USA. These helmet pads are designed to be used with our Advance Unit. You plug the helmet pad’s 3.5mm audio cable directly into your Advance Unit to establish communication. The microphone and speaker piece on the helmet pads are completely waterproof. The design of the helmet pad allows the flexibility to change out either the microphone piece or speaker piece if it becomes damaged over time. The double sided design provides complete ear protection. The pads fasten to your helmet by a marine grade Velcro. These are compatible with almost every helmet. The only helmet these will not adhere to are those that are rubber painted. From the date of purchase, the helmet speaker pads and all it’s components are covered for 6 months. Please see our warranty section for complete warranty details.